Dani Rowe after winning bronze medal for Wales at the Commonwealth Games road race in Australia. Dani Rowe has today announced her retirement from cycling – just months after winning bronze for Wales at the Commonwealth Games. The 28-year-old, nee King, finished third in the road race on the Gold Coast having switched allegiance from England. She has been based in Cardiff for several years and married Welsh cyclist Matt Rowe, brother of Team Sky’s Luke and opted to represent Wales at the Commonwealth Games. “Today marks both the end of one chapter in my career, and the start of a new one. As from today I’m announcing my retirement from professional cycling,” said Rowe, who has already been linked to a coaching role within British Cycling. “I feel privileged to be able to finish my professional cycling career on my own terms & in a great place mentally with the sport. I’m an achiever & I’m driven through hitting and improving on targets I set myself. After winning a medal in the Commonwealth Games I have won a major medal in all that I can in cycling & it’s now time to enter the next chapter of my life. Rowe, far left, after winning Team Pursuit gold in London 2012 with Laura Kenny (centre) and Joanna Rowsell Shand. “Cycling has enriched my life in so many ways, and given me the highest of highs and also plenty of lows that have shaped me into the person I am today, and I will always be so thankful for that. “I’ve met my closest friends and my husband through the sport. I want to take this opportunity to thank everyone who has been on this amazing journey with me, but especially my parents, sister Sarah, and husband Matt who have provided the most amazing support. Rowe’s first global title came at the 2011 UCI Track World Championships when she won the team pursuit alongside Wendy Houvenhagel and Laura Kenny. The following year saw her replicate this achievement and then go on to claim an historic Olympic gold medal in London, while she then went on to complete a hat-trick of team pursuit world titles in 2013. Having moved to Wales, Rowe was involved in a serious crash while out on a training ride near Merthyr Tydfil and suffered five broken ribs and a collapsed lung. Rowe was in intensive care on a spinal board in hospital following the crash when another rider hit a submerged pot-hole and another companion fell on top of her. 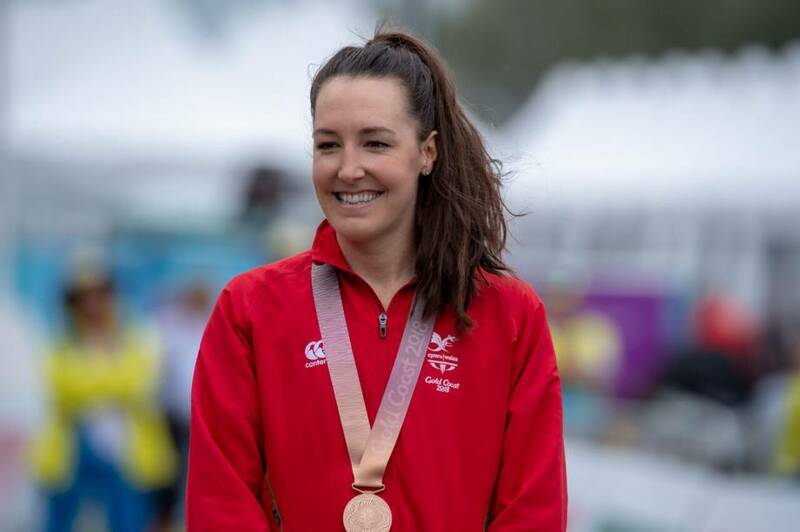 But she bravely battled back to fitness and in the last few years had been focusing on her road career where she took bronze for Wales in Australia last April. Dani Rowe on stage after winning Welsh Women’s Criterium Championships. Great Britain Cycling Team Performance Director, Stephen Park has said there could be a coaching role available to Rowe using her experience to mentor younger riders. Park said: “On behalf of everyone within the Great Britain Cycling Team, I’d like to congratulate Dani on what has been a truly exceptional career. “Her fighting spirit and resilience have been evident at various points during her career and, throughout her impressive list of achievements, her attitude has been exemplary. “That has become increasingly important in recent years, as she’s acted as a senior member of our women’s road squad – she’s been a true role model for the younger members of the squad and, I’m sure, for many, many other riders who have watched from afar. “This natural talent for mentoring and developing young riders has shone through, and will continue to stand Dani – and those she works with – in good stead going forward. “Dani is keen to stay involved with British Cycling and the sport as a whole, which will be valuable to all parties. I look forward to having further discussions with Dani once she’s enjoyed a seasonal break.